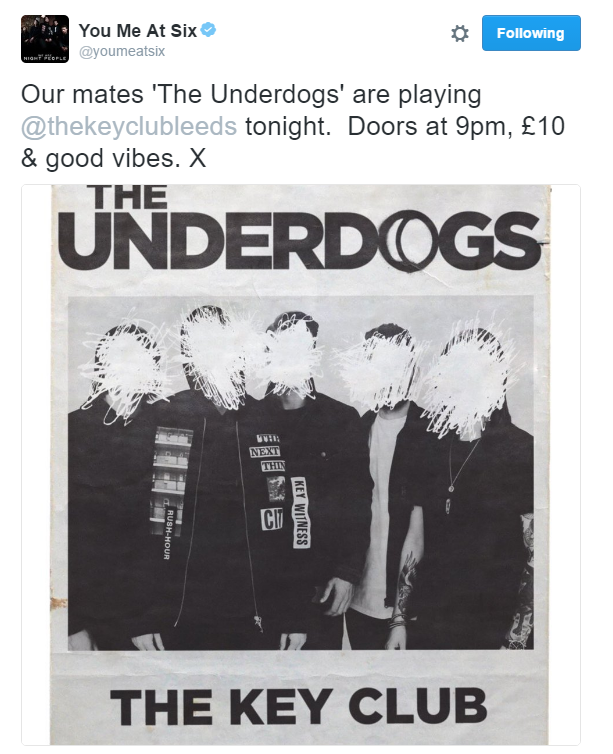 THE UNDERDOGS, who are they some of you may say? Well, they just so happen to be a very, very, very identical tribute to YOU ME AT SIX. It was so, totally obvious that this was going to be a secret set from the boys in YMAS and I couldn't have been more excited, excited to the point where uni work went out the window for few hours while I partied with one of my favourite bands in a 300 capacity venue. Stood in the freezing cold queuing for almost an hour and a half was so totally worth it. Opening up with 'Save It For The Bedroom' and 'Loverboy' the crowd literally went insane and we were instantly dancing, jumping and singing at the top of our lungs. The band are currently on a promo run of their latest album, Night People (which you should totally buy because they can get to number one this week), so of course there were going to be some new tracks, tracks which the fans in Leeds were lucky enough to hear before anyone else including 'Swear', 'Heavy Soul', 'Plus One', 'Give' before finishing the set with 'Night People'. All of which were performed so bloody well and it's safe to say that the new album is just as good, if not better live than it is on the recorded album. Midway through the set the band stopped to thank venue manager and director of Slam Dunk, Ben Ray for the night and also for believing and investing in them from the start of the You Me At Six journey and he was rewarded with cheers and a round of applause from the crowd who are also all very grateful for his existence, especially here in Leeds. Myself, and many others were just expecting a short show with just tracks off the new album but to our surprise they played a full, 15-song set for only £10! The rest of the set included a couple of tracks off 2014s Cavalier Youth including 'Lived A Lie', 'Win Some, Lose Some' and 'Room To Breathe', as well as from 2011s Sinners Never Sleep and 2010s Hold Me Down ('Stay With Me' may or may not have reduced me to tears). Of course, The Underdogs couldn't have played without actually including 'Underdog' in the set and with Josh holding the mic out to the crowd while everyone sang the lyrics back to the band. The venue was nothing other than a sweat pit of excitable people and a few crowd-surfers making their ways around the room. Of course a band can't come to Yorkshire and not expect to hear a 'Yorkkkkkshirreeeee' chant and that's exactly what You Me At Six received. The final two tracks of the night saw Josh testing his vocals in 'Bite My Tongue' where he did a bloody good job of Oli Sykes' section of the track and there's something all that more attractive about his voice sounding so rough and raw. Just amazing. Unfortunately the night had to come to a close and it was brought to an end with 'Night People'. Now will this setlist be a taster of what's to come in April or will they mix it up a bit? Only you can find out by getting tickets and having a bloody good night. Until April, I'll be kipping the album on a spin (already contender for album of the year). Night People is available now from pretty much everywhere - go pick a copy up or check out whee it's available here.